Buff, attractive guys, we’ve found your perfect costume for Halloween 2011. If you are neither of those things, this may be difficult to pull of, we’re warning you. 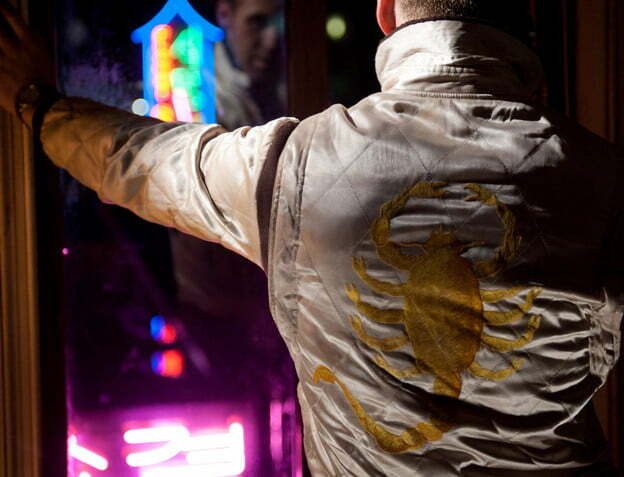 If you’ve seen Gosling’s latest film Drive, you probably envied his character’s cool-guy attitude and swagger, including his signature scorpion jacket and driving gloves. Well, if you’ve got $160 you can now own the officially-licensed silky Drive Scorpion Jacket, which is at least half of the cool-guy formula from the film. Leather driving gloves aren’t that hard to find, we promise. The silky cream quilted jacket features black cuffs and collar and the signature yellow scorpion across the back. Unless you have a really cool stunt-man job or a ballsy sense of style, this jacket may not be appropriate for non-costume events, but we’ll give you the benefit of the doubt that you can figure out a few different places to wear this thing.